GPS navigation currently doesn´t lead you anywhere but to the villages center. 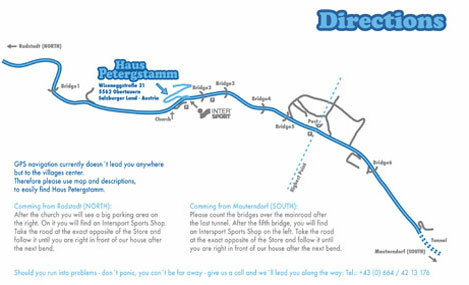 Therefore please use map and descriptions, to easily find Haus Petergstamm. After the church you will see a big parking area on the right. On it you will find an Intersport Sports Shop. Take the road at the exactly opposite of the store and follow it until you are right in front of our house after the next bend.